Visit our Newsletters page to find out more about Stepping Stones and subscribe to our newsletters! 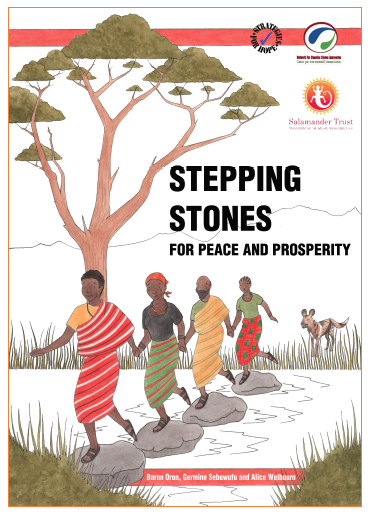 We are happy to announce Stepping Stones for Peace and Prosperity, our latest adaptation of the Stepping Stones programme. It is specifically designed to help facilitators to run workshops within communities to improve communication and relationship skills, so as to promote peace and prosperity by reducing conflict and violence in Karamoja, sub-region, Uganda. It is recommended for any community affected by small arms proliferation, conflict and sexual violence. Click here to see a Power Point presentation made about the package for the Men Engage conference Symposium held in Delhi in November 2014. “[The programme] changed attitudes completely, [things are] totally different since the coming of Stepping Stones. It has brought co-operation within family members like fathers and mothers. The man used to be lying under the tree, today they share ideas together. If it’s cultivating – they all go together; if it’s looking for survival; they all share together.” Women Participants, Tufts Evaluation 2014. This adaptation is the result of a collaboration between NESSA, Salamander Trust and Strategies for Hope. It is co-authored by Baron Oron, Germine Sebuwufu and Alice Welbourn. For more information about the programme you can email ststk [at] steppingstonesfeedback [dot] org (written like this to avoid spam). See also here.